The 4* Mercure Moscow Paveletskaya is a design hotel in a quiet location on ul. Bakhrushina in the center of Moscow, 2 mins from Paveletskaya station and the AeroExpress to Domodedovo. 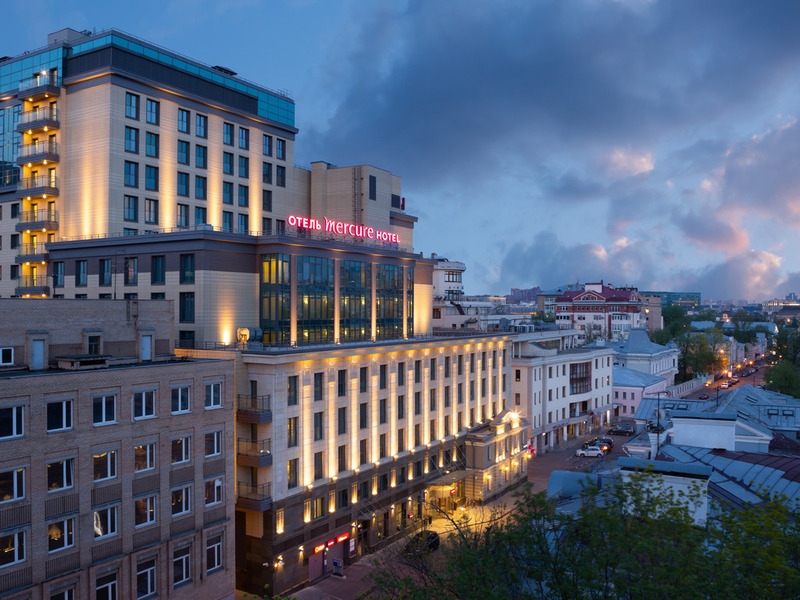 149 stylish rooms in a unique design, close to the business and historical center of Moscow, free WIFI, Town House restaurant, bar, fitness center, wellness center, 8 conference rooms, underground car park. The perfect base from which to explore Moscow or for shopping, business meetings and relaxation. Discover Mercure! Fine cuisine and a selection of excellent wines, exceptional service and the designer restaurant interior create the cozy atmosphere of a true gourmet restaurant. Come and enjoy this unique ambiance. This bar is ideal to get together, chill out and linger in the evening, or meet in a relaxed space during the day. I love this 4* hotel, since you feel here always as vip Great location, very close to all sightseeing. You can take the tram 5 min walk and have greate travel in old downtown of Moscow. Fully suggesting to stay here. Usually in a review there is a but......but there isn't one here. Only slightly more expensive than neighbouring IBIS 3 stars, well worth it. From check in to check out, I don't think there wasn't anything I could fault? . Attentive reception, friendly bar staff, great breakfast ( I didn't try the dinners). The hotel is nice, has comfortable rooms, friendly personal. Excellent stay (2 nights) in Mercure Paveletskaya. Excellent experience: very smooth check-in and check-out, very good room, excellent breakfast and excellent location of hotel, near M-station Paveletskaya. Within a (sportive) walking distance from Paveletskaya station (direct train to Domodedovo airport), this comfy hotel has everything the business traveler may need. Comfortable spacious rooms, good breakfast, etc. Located in a very quiet neighborhood, there are shopping centers, restaurants and animation around in a walking distance. 10-15' away from the nearest Metro station. Good relationship in terms of price abdquality of services , quite close to the city center main monumentes ( Red Square , St.Basil , Lenin's mausoleum Kremlin , Bolshoi Theatre) and well connected with the metro , just two stops away. This was not the first time for me. Everything met my expectations fully. Room clean up could be improved - cup not washed, water bottle not replaced. And, thank you for the upgrade. As usual when in Moscow... Mercure Paveltskaya! Nice stay, a comfortable hotel in a very good location in Moscow, close to Metro and to the beautiful Zamoskvareche district plenty of caffe, bar and restaurants. Comfortable room, excellent location, nice staff. The only minus- bathroom was not clean, there were some hair on the floor, and stains on tiles. But all the rest is OK. Bed is comfortable, staff is friendly. if you come to Moscow I recommend you to stay here. From airport to hotel, just take gett taxi app and cost around 1450RUB. Or you can take train to Paveletskaya station, walk straight from station to the other side of the road (around 10 min walk) but gett taxi may be cheaper than train ticket if you come 2-3 person because can share the cost.During the stay, you walk from the hotel to Metro Paveletskaya station (green and brown line) (opposite of Paveletskaya train station) Remember exit no.2 is nearest.The room is great and all in mini bar, 3 soft drinks and 2 juices) you can drink for free. Also Nespresso coffee is ready to use. And wifi is very fast especially upload. Staff is helpful. If I return to Moscow, will book this hotel again. Great location, great room. Staff very friendly and helpful. It was amazing: extremely kind and caring staff, excellent accommodation, all great of F&B. Pleasant stay in a well situated and comfortable hotel. Friendly staff, comfortable and quiet room in a hotel conveniently located to come and go from and to Domodedovo airport by train.Breakfast was abundant in a fine restaurant. Adjustment of my stay to modifications due to short notice customer alterations were made on site without any problem!Only very secondary improvement consideration would be to look after bathroom door and its frame damaged on the bottom part due to humidity. Location, service and comfort and price of this hotel are very attractive for short business trip to Moscow with arrival|departure at Domodedovo airport. Good facility for lunch in the adjacent IBIS hotel!Very polite and helpful staff. Good example of Mercure brand hotel. Everything was in order. Good room, good gym, nice breakfast. Stayed for one night to fly to another location the next day. If you have a connection in the afternoon the next day, it is a nice option. Just get on Aeroexpress, get to the hotel by taxi and enjoy your stay in Moscow, have fun for a day. Brilliant service and great location! Many thanks to very friendly staff at reception, room service and hotel bar! Totally worth to stay at heart of Moscow in very nice and modern hotel.Standard room was quite small, but very clean and quite.